Each year in May,locations all over Ireland (and abroad) host a 5K walk which takes place in the early hours of a Saturday morning. The reason for the early start (4am sharp) is because the theme of the walk is Darkness into Light , and so it is timed so that the walkers reach the end point just as the dawn begins. The purpose of the walk is to raise valuable funds for the Pieta House Suicide and Self Harm Crisis Centre, but it is also a chance to remember all those loved ones that we have lost through suicide, and remind us that no matter what, there is always hope. 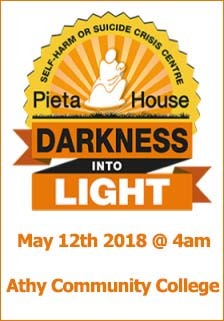 Darkness Into Light, proudly supported by Electric Ireland, is the absolute highlight of the Pieta House calendar! Darkness Into Light is coming back to Athy in 2018 for the 3rd time and we are very excited to walk alongside the other Irish venues as a positive show of support for Pieta House .The venue is to be confirmed and all other details to follow. With several hundred people joining us for our first event in Dublin's Phoenix Park seven years ago, to thousands upon thousands of people across nearly 40 locations in May of last year, Darkness Into Light in aid of Pieta House, the centre for the prevention of suicide and self-harm, has grown beyond all expectations. In 2009, the Phoenix Park saw the first of the yellow t-shirt clad people assembling at an unthinkable hour. There were about 400 people that fateful morning, all huddled together in the blackness and the cold, standing behind the starting line. Who would have guessed that seven years on, the little event we call Darkness Into Light would be the symbol of hope, the celebration of life that it is today? With close to 80,000 participants last year, how could it get any bigger? But it has, and now Darkness Into Light is celebrated in 80 venues in Ireland and much further afield. In addition, we are thrilled to once again have our sponsor Electric Ireland, the leading energy supplier in the country on board to this year's event is the best yet. Think about the thousands upon thousands upon thousands of remarkable people who attended last year. Think about how delicious it will be to collapse back into your warm bed later on that morning, knowing that you’ve done your good deed for the day, and your exercise for the week! But ultimately, think about how Darkness Into Light is the flagship fundraising and awareness event for Pieta House, and without your support, we could not have helped so many people in suicidal distress and engaging in self-harm over the last nine years. Pieta House has nearly 180 staff and we've welcome nearly 18,000 people into our nine centres up and down the country since we first opened our doors over nine years ago. We're encouraging all those taking part in this year's event to reach out and share your experience with the person beside you - no one should walk alone!